Tonga is a country in Pacific Ocean. It has 169 islands. Only 36 islands have inhabitants. The most important island is Tongatapu. George Tupou V is the king of Tonga and the Prime Minister is Sialeʻataongo Tuʻivakanō. The capital of Tonga is Nuku'alofa. 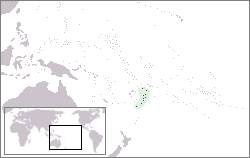 The official languages of Tonga are Tongan and English. Tonga has 102 321 inhabitants (2000). It's a very hot country. Tonga became independent in 1970. About 3000 years before, the Polynesians had settled in Tongatapu. Between 1845 and 1893, slavery was stopped. Also, constitution was made up. In 1900, Tonga became a protected state of the United Kingdom. Foreign affairs was managed by the UK. Tonga was no longer a protected state and became independent in 1970. This page was last changed on 25 September 2014, at 14:16.